I am making a quilt! Yes, I am. I really am. It will be for my Grandma, who turns 90 next month. She has recently moved into a nursing home. She does not want to be there, she wants to be back at home. I can't blame her, but she needs lots of help with everyday things and the nursing home can help her with these. We visited her in February when we were in Melbourne. I immediately felt that her room needed some more hand made goodness. She has been able to bring a few items of furniture from home. My step-dad installed some shelves, and they have been filled up with family photos. 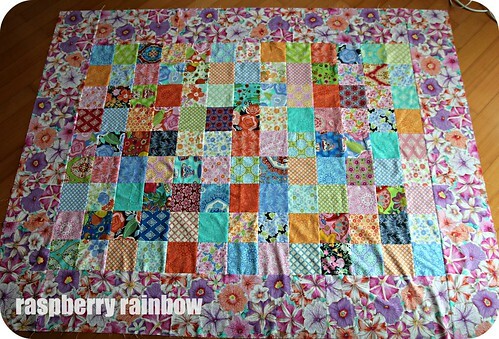 I felt she needed a happy, bright quilt for her bed. One made with love - so my mum and I got started right away. 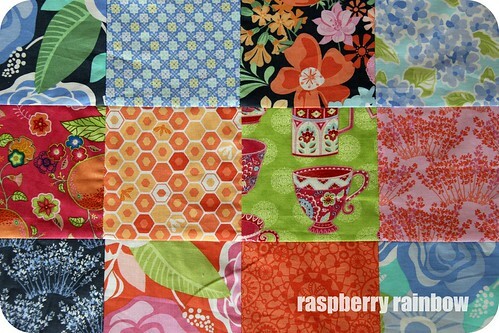 I had "won" some fabric charm packs (pre-cut fabric squares) in the Let's get Maybelle to the Ellen Show charity auction. We used two packs of "Honey Honey" by Kate Spain for Moda and part of a "Trade Winds" by Lily Ashbury for Moda. Yesterday, I finally found the courage to make the backing. We had chosen more of the petunias fabric (in different colour ways). 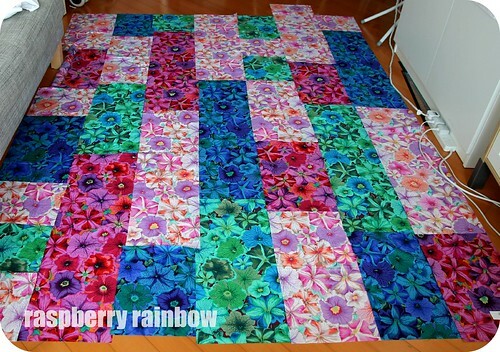 Today I will finish sewing the petunias backing together. 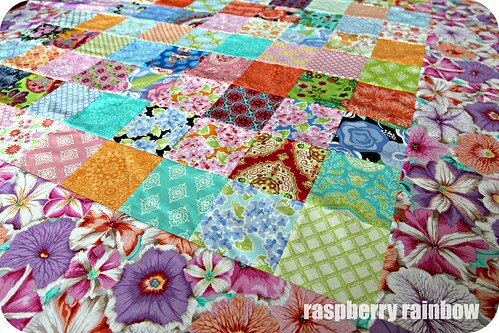 Then I will be ready to quilt this. This is what I am scared about. I have never done this before. I'll read a few more (hundred) online tutorials. I hope I'll be ready then to quilt. If you can recommend any great online tutorials, please let me know. That is a beautiful bright Quilt Cat,I'm sure your Grandma will love it, it will bring love and sunshine into her room, well done. I really love your quilt and the colours are amazing. i'm sure that your Grandmother will love it. it will really add colour and warmth to her room. Meet your follower number 136. Hi! I absolutely adore your blog and I love reading it. Such an adventure moving all the way from Melbourne to Hong Kong. I imagine you'll find many nice fabrics there to make all kind of funny and lovely things. Cat, I'm sure your gran will love her new quilt! It'll be just the thing to brighten up her room and make it feel more comfy. Such a lovely thing to do!